Medical blunders, a risk to the power grid and a possible dissident republican link to ATM thefts make the front pages on Tuesday. 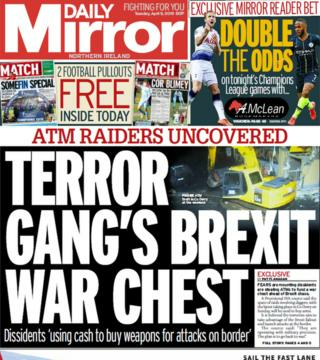 "Terror gang's Brexit war chest" is the headline on the front of the Daily Mirror. The paper says a "senior Provisional IRA source" has said dissident republicans are involved in the recent spate of cash machine thefts. It says a gang responsible for some of the thefts has netted £603,000. According to the Mirror's source, dissidents will use the cash to buy guns and explosives. "They plan to be ready to take advantage of the chaos caused by Brexit to mount attacks on any border posts erected on the frontier," the paper says. On its front page, the Belfast Telegraph says that settling legal claims after medical blunders in Northern Ireland is expected to cost £400m over five years. It says medical negligence claims are costing the health service here £215,000 every day. A total of 349 serious adverse incidents were recorded in Northern Ireland last year. The Telegraph also has a picture of Bangor woman Phoebe Lyle, who was left paralysed by a hit and run driver while on holiday in Spain when she was a toddler. She tells the paper the driver who struck her got out and said he would go and get help, but that they never saw him again. Phoebe says despite what he did, she forgives him and wants to meet him. 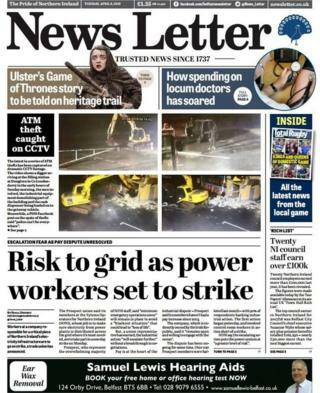 "Risk to grid as power workers set to strike" is the headline on the front of the News Letter. The Prospect union has said its workers at Systems Operators Northern Ireland, whose job is to make sure electricity from power plants is distributed across the grid, are to take part in a one-day strike on Monday. Prospect said minimum emergency cover will remain in place to avoid a blackout situation. However, it said without a breakthrough in negotiations the industrial action would "escalate further". The Irish News says a requirement for the new PSNI chief constable to have served in a senior role in an outside police force has been removed. It says the Policing Board has removed the criterion in order to open up the job to the widest pool of candidates possible. The front page of the paper is dominated by a picture of former Trócaire worker Sally O'Neill, who was killed in a car crash in Guatemala. The paper says the Dungannon woman has been described the heartbeat of the charity for 40 years. In its coverage of the recent ATM thefts in Northern Ireland and across the border, the Irish News says that dye packs used in the past are no longer effective. The dye makes paper notes unusable but do not work on the newly-introduced polymer notes. The paper's Allison Morris says the majority of the raids appear to have been carried out by one gang. She says that unlike larger paramilitary groups, a small criminal gang from a rural area is more difficult to infiltrate or gather intelligence on. All the papers report on a new medieval heritage trail in Northern Ireland inspired by hit HBO series Game of Thrones. Many sites and monuments in Northern Ireland have been used in the production of the epic show. Journey Beyond Westeros will introduce visitors to the history of the various sites. According to the Belfast Telegraph, the sites could include Carrickfergus Castle, Tullaghoge Fort, Dundrum Castle, Bonamargy Friary, Dungannon Castle and Enniskillen Castle.